Et Verbum: Simple instructions On The Holy Eucharist As A Sacrament And Sacrifice by The Very Rev. Geo. Edw. Canon Howe. Part 22. Simple instructions On The Holy Eucharist As A Sacrament And Sacrifice by The Very Rev. Geo. Edw. Canon Howe. Part 22. In the Old Law, God Himself gave minute instructions to Moses concerning the different vestments His ministers had to wear while serving the Altar. Full details may be read in the twenty-eighth chapter of the book of Exodus, while Leviticus treats at great length of the offices and ministries, rites and ceremonies of the Priests and Levites. Even the pagan priesthood assumed special garments when offering sacrifice to their idols, or when performing the rites of their superstitious worship. A natural sentiment suggests to man something similar in civil life ; thus it is that we have the judge in the tribunal of justice and the barrister pleading before him, distinguished by their peculiar robes of office. When audience is given by Pope or King, etiquette requires that, on such formal occasions, those who are granted the favour of such audience should be becomingly attired, and dress according to the custom of the Court at which they present themselves. Thus it is that, from almost the earliest ages of the Christian dispensation, the ministers of the Altar have used special garments and ornaments in carrying out the Liturgy, and various other services of the Church ; and history tells how these costly vestments and sacred vessels became the object of the cupidity of the early persecutors. Both religion and propriety suggest the adoption of some distinctive garb for the Clergy, while occupied in the public functions of their ministry, whether in offering the Sacrifice, or in administering the Sacraments. The wish of the Church in this is that both Pastor and People should conceive a high idea of the solemnity of God's service, and of all that appertains to His worship. She, therefore, requires her priests and various assistant ministers to lay aside their secular dress and array themselves in becoming vestments, whenever they approach the Altar for the celebration of the Divine Mysteries. She loves to see these vestments, etc., as rich and beautiful as means may allow, as also the various sacred vessels that are used in her services. 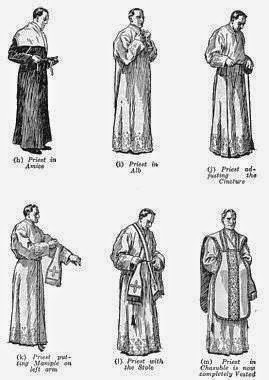 It may first of all be stated that the everyday garment of the Clergy, to be worn at all times in the church is, the Cassock, over which he puts others when about to perform any religious ceremony. The cassock is black for priests, purple for bishops, scarlet for cardinals, and white for the Pope. 1. The Amice, a white linen cloth, nearly square, to cover the neck and shoulders. Formerly, it covered also the head, in place of the present biretta. This historical fact is recalled nowadays by the act of the priest in putting it on, for he touches the crown of his head with the amice, before laying it on his shoulders, while priests of the Dominican order to this day wear it over their heads, in going to and from the Altar. It is as the " helmet of salvation" to enable the priest to resist the attacks of the evil One, as the prayer suggests that he says, while arranging it round his neck. Some see in the amice a reminder of the cloth with which Veronica wiped the face of Jesus, as He was on His way to Calvary, while to others it recalls His blindfolding by the soldiers, who smote Him and said: " Prophesy who it is that struck thee! " (Luke xxii. 64). 2. The Alb is the long and ample white garment of linen that reaches from the shoulders down to the ankles, the lower part of it being usually ornamented in a variety of ways. Its whiteness denotes the purity of soul and body that must adorn the priest, who undertakes so sublime a work as the offering of sacrifice to God, and it vividly recalls the white garment that Herod mockingly placed on Our Lord, when He sent him back to Pilate (Luke xxiii. 11).—The Surplice and Cotta are merely the Alb in shorter form, and bear the same symbolical meaning. 3. The Girdle, formerly broad and flat, is the linen cord that gathers up the Alb at the waist. It suggests the girding of the loins, (Isa. xi. 5 ; Luke xii. 35), or the restraint we must put on our evil inclinations, as expressed in the short prayer which the priest says while putting it on. It serves to recall the ropes with which the executioners bound Our Lord in the Garden, or fastened Him to the column of flagellation. Though usually white, it may lawfully be of the same colour as the vestments with which it is used. 4. The Maniple was originally a cloth, intended for ordinary use, as a napkin or handkerchief, for wiping away perspiration from the face or brow, occasioned by the heat, or by the labours of the ministry ; but by the twelfth century, the piety of the Faithful had led them to ornament it to such an extent, that it could no longer serve its original purpose. With her conservative instinct, however, the Church retained it as one of her liturgical vestments, and gave to it a symbolical meaning: a reminder to the priest of toil and labours of life, and of the reward that awaits him hereafter, if he bear them in patience for God. It is worn on the left arm, and represents the bonds Our Saviour was placed in, the night before He died. 5. The Stole is the long band, of same material as the maniple and chasuble, that rests on the priest's neck, and hangs down to about the knees. For Mass, it is crossed on the breast and held in position by the girdle, though, in the case of a Bishop, it is allowed to hang without crossing, as he already has his pectoral cross on his breast. The stole still further symbolises the cords that bound Our Saviour, as He was dragged up to Calvary. It represents to us the yoke of Christ, which is sweet and light, and should be cheerfully taken up by His followers. It likewise denotes authority; hence the priest wears it while preaching the Word of God, and while administering any of the sacraments. 6. The Chasuble is the uppermost of all the vestments worn at Mass, representing the garment Our Lord had placed upon Him, when He was being derided as " King of the Jews" (John. xix. 3). It also recalls the Cross He bore on His shoulders on His way to death, for the Chasuble usually has a large cross on the back. For over a thousand years it covered the whole body, and had to be raised at the sides to allow the arms freedom of motion, in performing the ceremonies of the Mass. When heavier and more precious material came to be used in the making of the Chasuble, and ornamentation was also added, it was found to be very cumbersome and inconvenient to lift up, so the sides were somewhat cut away, till at length its present form gradually came into use. It is the noblest of all the sacerdotal garments, and Alcuin, our fellow-countryman of the ninth century, regarded it as emblematical of Charity—love of God and man— charity that covereth a multitude of sins, for the Chasuble, in his .day, covered the entire person of the priest. A word should here be said on two other ornaments required at Mass, though they be in no sense vestments. The Chalice Veil is the square of flexible material which the priest places over *the Chalice, when he carries it to the Altar for Mass. It remains on it till the Offertory, when it is taken off and laid on the epistle side of the Altar till after the ablutions ; then it is replaced on the Chalice, and, after Mass, carried back to the Sacristy. The antiquity of the Chalice Veil is very great, and probably goes back as far as the fourth century. It is always of the same material and colour as the vestments with which it is used, and generally has a cross worked on the upper side. The Burse is a square pocket, formed of two pieces of cardboard, covered again with the same material as the Veil, and rests on the veil. In this pocket is placed, for use during Mass, the Corporal, a square of linen, whereon the Chalice and Particle remain, from the Offertory till the priest's Communion, the burse itself meanwhile standing to the left of the Tabernacle. To complete this subject, the Cope should also be named ; it is not a vestment used for Mass, but it has a close relation to the Blessed Sacrament, inasmuch as it is worn by the priest at Benediction, of which something will be said later on. 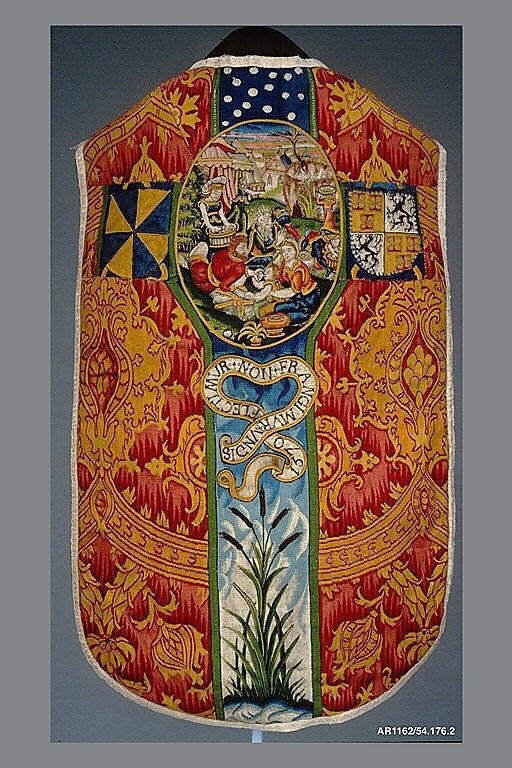 The Cope is an ample sleeveless vestment, made of silk or other similar material, reaching from the neck down to the feet. It thus covers the whole body of the priest, something like the early Chasuble, except that the Cope is open in front, being held in position by a morse, or some sort of clasp on the breast. Formerly, it bore a hood at the back to cover the head in processions ; this, however, is now a merely ornamental appendage, highly adorned, and usually edged with fringe. The Copes are made of the same various colours as the Vestments for Mass, but white is always its colour when used at Benediction. Unlike the Chasuble, the Cope may be worn by others than the Clergy, for instance, by the Cantors at Vespers. While the priest is giving the blessing at Benediction he wears on his shoulders the Humeral Veil, with which, for greater reverence, he covers his hands, when taking the Monstrance, for the blessing of the people. A similar Veil is worn by the sub-deacon during a good portion of High Mass. In all these various Vestments which the Church requires us to use in connection with the Blessed Sacrament, we may clearly see how anxious she is to show reverence to It, and to inspire respect for all her services. As God in the Old Law was so particular and exacting as to the garments of those who were to offer Him Sacrifice and praise, so, too, is the Church in regulating her sacred Liturgy. Be it therefore our endeavour to profit by the lessons she here inculcates, by ever showing becoming honour and veneration, whenever we are privileged to assist at any of the Church's functions. We may also show our zeal for the glory of God's Sanctuary by helping to provide the Vestments that are necessary, and by making them as worthy of their object as our means may allow. In the first years of the Christian Church, only two colours were in use, white and red, and it was only gradually that the liturgical colours of the present day came to be employed. From the time of Pope Innocent III., in the twelfth century, five different colours for the vestments of the Mass have been recognised, and later on became obligatory, to the exclusion, generally, of all others. These colours were, and still are, White, Red, Green, Purple, and Black. 1. White. —White signifies the fulness of light, and is typical of Our Lord, who is the Sun of justice and the Light of the world ; it is the emblem of Heaven's enchanting beauty and the symbol of perfect joy. Hence, white is the colour used on the festivals of Our Saviour, excluding such as commemorate His sufferings ; on the feasts of the Blessed Virgin, the flower of wondrous purity and brightness, clothed with the sun, as Queen of the Angels ; also on the feasts of Confessors, Virgins, and saintly women who have adorned the Church with the radiance of their purity and sanctity. 2. Red. —Its warmth symbolises fire, while its colour is that of blood. Thus it is appropriately used on Pentecost, the feast of the Holy Ghost, who is the burning love of God, and came down upon the Apostles in the form of " tongues as it were of fire " ; on the feasts of Our Lord's Passion ; on feasts of the Holy Cross ; and finally of the Apostles and Martyrs, who shed their blood in defence of the Faith. 3. Green, the emblem of hope, is the colour of the earth in the spring, when all nature revives, when the grass and the trees bud forth, putting on their brightest green, and bringing hope to the hearts of men. Now, our hope of eternal life is based on the Resurrection of Our Lord, which has ever been honoured by the Church on Sunday. Hence, green is the colour used in the offices of Sunday, unless some other office for any reason takes precedence, and requires another colour. 4. Purple, in the eyes of the Church, is the symbol of penance and atonement; hence, she naturally prescribes its use in such seasons as Advent and Lent, on Ember Days and certain Vigils, except again that Feasts may sometimes take precedence, with colours peculiar to themselves. 5. Black is the fifth of the liturgical colours. It is the absence of light and therefore of joy, and suggestive of sorrow and death. Consequently, it is used on Good Friday, when the whole Church mourns the memory of her Saviour's death on the Cross, which, though it brought salvation and joy to the human race, yet involved humiliation, agony, and death upon Jesus Christ. A similar thought is suggested in the office of the Dead. Death leaves mourning and anguish behind it, and the Church, with the tenderness of a mother, shares, in her religious functions, the sorrows of her children's bereavements, and in Requiem Masses wears black vestments, as sign of her sympathy with their grief, and of her own mourning for her departed children. In the burial of infants, however, not the black stole of sorrow is used, but the white stole of joy, in that, having died in the innocence of their baptism, they already possess the joys of Heaven, which should not be the cause of sadness or sorrow. These are the five liturgical colours now in use in the Church, though it must be added that Vestments of real cloth of gold may be used instead of white, red, or green, but not of purple or black. It might be useful to us, if, whenever we assist at Holy Mass, we could try and enter into the spirit of the moment, as suggested by the colour of the Vestments then in use, endeavouring to excite within ourselves the various sentiments they symbolise, whether of sadness or joy, whether of reparation for the past or of hope for the future. Something must now be said of the Sacred Vessels that are used in connection with the Blessed Sacrament, though it may hardly be necessary to refer to them at any great length. They may be reckoned as six in number. consecration. Our Lord Himself used some such vessel at die Last Supper, as we read in the Gospel of S. Matthew xxvi. 27. That individual Chalice, as some maintain, was the one used by Melchisedech, and is preserved at Valencia in Spain, where it is held in the highest veneration, as it well may be, if it really be the Chalice used by Our Lord. According to the present discipline of the Church, the Chalice must be made of gold or silver ; at the least the cup must be, the inner part of which must always be gilt. 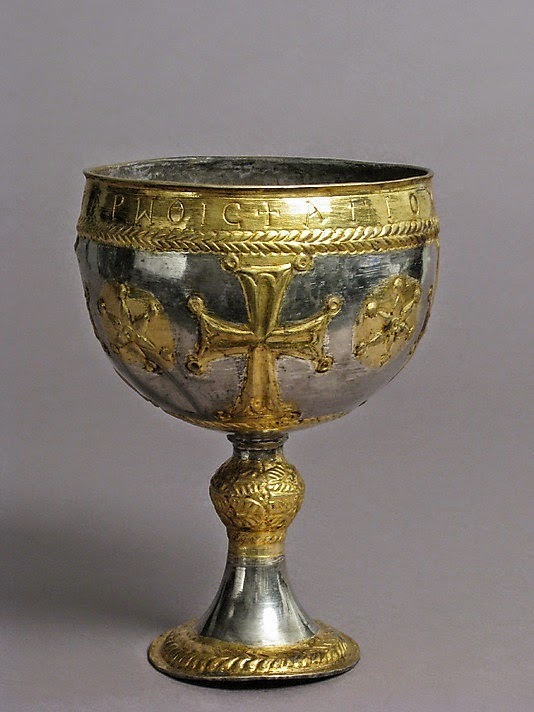 In the very early days, especially during the persecutions, chalices were made of other materials ; but reverence requires and the Church now insists that they be of one or other of the two precious metals, and not unfrequently are they very richly ornamented as well. In every case, the Chalice must be consecrated by a Bishop, who uses chrism for the purpose, according to the form given in the Pontificate, after which the sacred vessel may not be touched, except by persons in Holy Orders. 2. The Paten is the small plate of gold or silver, on which the particle of bread is laid that is to be consecrated at Mass; it thus becomes a figure of the Cross, on which Our Lord's body was laid for crucifixion. This, too, must be consecrated like the Chalice, after which only those in Holy Orders may handle it. The reverence the Church has ever shown in consecrating Chalice and Paten, which come into immediate contact with the Body and Blood of Our Lord in the Holy Sacrifice, and the great care she has always displayed as to their safe custody, are a powerful argument of her general and ancient belief in the Real Presence after the Consecration. 3. The Ciborium is something like the Chalice, except that the cup is usually larger, but more shallow, and has a lid to it, covered with a silken veil. It is used to preserve the smaller consecrated breads, to be given to the Faithful in Holy Communion. When thus containing the Blessed Sacrament it is always placed under lock and key in the tabernacle. Hence the custom of pious souls to make visits of devotion to the Blessed Sacrament thus preserved; hence, too, the reason for the ever burning Lamp before the Altar, to which reference has already been made in these pages. The same faith which leads the Church to insist on the precious metals being used for Chalice and Paten, guides her also in making the Ciborium as rich as means will allow; but because it is not used for the Sacrifice, it is not consecrated, but merely blessed before use. This holds true also of the following. 4. The Monstrance.— From the Latin word monstrare, to show, we have the name monstrance, a large vessel in which the Blessed Sacrament is exposed and shown to the people at Benediction, or is carried in solemn procession on greater festivals. It has a large base and stem, and on its upper part, rays are represented as darting forth from a circular aperture in the centre, in which the Sacred Host is placed. These rays may recall to our minds the divine splendour of Our Lord's face, during His transfiguration on Mount Thabor (Matt. xvii. 2). The Monstrance first came into use about the time of the institution of the feast of Corpus Christi, in the thirteenth century. 5. The Lunette is the smaller vessel actually holding the Blessed Sacrament, and fits into the circular aperture just referred to. After Benediction, it is replaced in the Tabernacle. 6. Lastly, there is the Pyx, about the size and shape of a small watchcase, in which the priest carries Holy Communion to the sick. In doing this, he places it in a silken burse, which he carries suspended on his breast by a cord passing round his neck. As in the Vestments, so also in the sacred Vessels of the Altar, the Faithful should take a practical interest, by endeavouring to provide their church with at least a reasonably good and valuable set, so that everything about the Altar and Sanctuary may be redolent of the earnest faith of priest and people who worship there, which will react on their hearts and strengthen that faith, recalling to their minds the Real Presence, for whose honour they have made sacrifices to provide of their best. When Noah came forth from the ark, after the waters of the Deluge had subsided, he immediately hastened to erect an altar, whereon to offer sacrifice to God, in acknowledgment of His supreme dominion, and in gratitude for his own marvellous preservation from destruction (Gen. viii. 20). From that day forward, we often read in Holy Writ of the use of altars. Throughout the Catholic world also, from Apostolic days down to the present time, wherever churches have been built to the glory of God, they have contained one or more altars for the celebration of the Sacred Mysteries, so that Altar and Sacrifice are correlative terms, that is, each one implies the other. Altar. —In the early days of persecution, altars were for the most part made of wood only, [That on which S. Peter is said to have offered up the Holy Sacrifice is now preserved in the Church of S. John Lateran, in Rome.] and it was not till peace had been given to the Church, under Constantine, the first Christian emperor, in the fourth century, that more durable and more precious materials could be used in the making of them, without fear of molestation or desecration. In the Catacombs, the Pontiffs offered Holy Mass over the tombs of the Saints, and especially of the Martyrs, whence arose the custom, which later became and still is the law, that the Holy Sacrifice may not be offered except on a stone containing relics of the Saints. 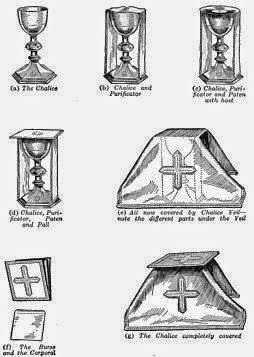 If the whole table of the Altar cannot be of stone or marble, a stone, at least large enough to conveniently hold the Chalice and the Bread, must be let into the wooden table in the centre, and the Altar or Altar Stone must be solemnly consecrated by a Bishop, before it may be used. It is of strict obligation that the Altar be covered with three linen cloths, the uppermost of which must not only cover the table, but also hang down at both sides and reach to the ground. That portion of it which hangs down in front of the length of the Altar is usually ornamented with some religious emblems or sacred words. These cloths must be blessed, for the Church employs nothing in her services that is not dedicated to God by prayer. " Every creature . . . is sanctified by the word of God and prayer" (I Tim. iv. 5). The right and left hand sides of the Altar are now spoken of with reference to the Crucifix ; thus, the right side is that on the right hand of the figure on the Cross, the Gospel side; the left side, that on the left hand of the figure, the Epistle side. The Altar symbolises Our Lord Himself, or again the hill of Calvary, whereon the first great Sacrifice was offered. Tabernacle. —This is the name given to a sort of small temple erected in the centre of the Altar. It has had a variety of forms during the length of its history, but now generally consists of an iron safe, let into a casing of the wood, marble, or alabaster of which the Altar itself is made. Herein the Holy Eucharist, under the form of bread, is reserved for the use of the Faithful. Hither they may come and pay homage to their Sacramental Lord ; from it He is taken and exposed to their view at Benediction, and from it, too, is carried to the homes of the sick and the dying, who cannot receive Him at the Altar. Candlesticks, three in number, are placed on each side of the Tabernacle, on the High or principal Altar. In the days of persecution, when the assemblies of the Faithful were held before the dawn, artificial light was necessary for them ; but the early Christians soon came to give the candles thus used a symbolical meaning, and when peace was restored to the Church, candles continued in use during the Sacred Mysteries, even when now performed in the full light of day. These lights are used in sign of spiritual joy, as was remarked by S. Jerome, so far back as the fourth century. They also fittingly represent Our Lord, who is the Light of the world that " enlighteneth every man that cometh into this world" (John i. 9). They serve also to remind us that we too should be as a light to the world around us, through the good example we should give, leading men to glorify our Father who is in Heaven. These candles must be made mainly of pure beeswax, and must be blessed before use. Lights were employed in the services of the Jewish Temple, and from this the Church borrowed her practice. As in the Mass we have indeed the most abundant cause for joy, two candles at least are absolutely required for its lawful celebration, so much so that if none can be procured, it may not be said, not even on a Sunday. Flowers. There is one place on earth that can never be too richly adorned, as was remarked in a previous chapter, and that is the sanctuary where Our Lord dwells amongst us. Nothing that we can do for Him can be too beautiful, and though He has no need of our gifts, He vouchsafes to accept such as we may be able to offer, as proof of our faith and devotion. As God Himself decks the earth with flowers of every shape and hue, so may we adorn His dwelling-place with such flowers as may be had, "love's truest language." The Faithful are urged to provide plants and flowers for the Altar and the sanctuary, especially on the greater festivals of the year, flowers that may waste their innocent lives away, as a prayer to God in their behalf; they should feel proud, honoured, and privileged in being allowed to contribute to the beauty of God's House. Only during penitential seasons and at the office for the Dead, should flowers fail to be seen. Both as regards candles and flowers, the Faithful have many opportunities of testifying their zeal and their faith, for they can be procured in large quantities or small, to suit the tastes and the purses of everyone. A Crucifix, or representation of Christ crucified, must be placed on the Tabernacle, and on any altar, where Holy Mass is offered. From the very birth of Christianity, the Faithful used to make the Sign of the Cross on themselves, but it was not for long years that the Church ventured to exhibit the Crucifix ; she was most cautious not to offend her converts, by showing them the image of our dying Saviour, for the Pagans always held the cross in horror, and anyone who died on a cross was regarded as most ignominious and contemptible: " Unto the Jews indeed a stumbling block, and unto the Gentiles foolishness " (1 Cor. i. 23). In course of time, however, the Cross and the Crucifix came to be displayed in public, and especially on churches, both inside and out. As the Altar is the emblem of Calvary, the representation of Christ crucified finds a fitting place upon it, and thus we have again a memorial of His sufferings for our redemption. Every Catholic home, in like manner, should have a Crucifix within its walls, to enable those who dwell there to exercise their faith, hope, and love in Him, especially in times of trial, sickness, and death. The Altar Cards, three in number, simply contain in separate form, for convenience' sake, certain prayers, etc., said in almost every Mass, without the need of referring each time to The Missal, or Mass Book. This is the large volume, resting on a stand, that contains all the prayers, hymns, and extracts from Holy Scripture, constituting the Liturgy. Some of these are said in every Mass, and are known as the " Common " of the Mass, e.g., the Kyrie, Sdnctus, etc. Others vary from day to day, and constitute the "Proper" of the Mass, e.g., the Introit, Collects, Epistle, and Gospel. The Bell. In the book of Exodus xviii. 35, and in Ecclus. xlv. 11, we read that by the ordinance of God, when Aaron entered or left the Sanctuary, little bells of gold, attached to his garments, should ring, to recall the minds of the children of Israel to what was going on, and inspire them with reverence for the services of the Temple. At the Mass, a bell is rung (gently, it should be) at certain times for a similar reason, as an admonition to the people, that they redouble their fervour and devotion at the more solemn parts of the Service. The Rubrics speak of a small bell, and a single one only. Thus, strictly speaking, chimes are not altogether to the mind of the Church, nor is the gong, however devotional and impressive the sound it gives, when properly struck, which unfortunately is not always the case. The bell is rung first of all at the Sanctus, giving warning that the Canon of the Mass is about to begin. Then, again, at the twofold Elevation ; the object here is to rouse the attention and piety of the Faithful, that those who may be unable to see or hear the priest, or perchance are just then distracted, may be reminded of the most solemn act of the Sacrifice, as though it would say to each one present: " The Lord is nigh, come let us adore," or, better still : " The Master is come and calleth for thee" (John xi. 28). When, then, we hear this call, at the sound of the bell, let us arise from distractions and present our homage to the Son of God, coming down upon the Altar. The Bell at this moment should also typify the spiritual joy we ought to feel at this new mystical birth of Our Saviour, as the Angels sang a hymn of joy at His temporal birth in Bethlehem. Only at the Sanctus and at the Elevation do the Rubrics direct the Bell to be rung ; custom, however, in this country at least, rings it when the priest spreads his hands over the Chalice, just before the Consecration, and again at the Domine, non sum dignus; this last serves to remind the Faithful to go up now to the Altar, if they desire to receive Holy Communion. From the Gloria on Maundy Thursday to the same on Holy Saturday, the Bell is not used at the Altar. During that time the Church is mourning over the passion and death of her Saviour; the joyousness of the Bells would be quite out of keeping with her ceremonies of these days, hence they remain silent. The Sanctuary Lamp has already been spoken of, and is only here referred to as completing the appurtenances of the Altar.